Preheat oven to 300 degrees. Combine flour, baking powder, cinnamon, and nutmeg. Cream together sugar and butter in a large bowl. Add vanilla, egg yolks and egg nog. Mix on medium till smooth. Add flour mixture and mix on low till blended. Drop by heaping teaspoons 1 ½ inches apart on an ungreased baking sheet. Sprinkle with nutmeg. Bake 25 minutes or until bottoms are brown. 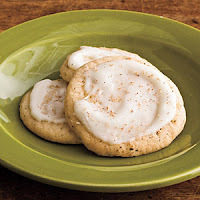 ****For frosting take 1 cup powdered sugar, 1 teaspoon ground nutmeg and 2 Tablespoons eggnog and whisk together until smooth. Spoon over cooled cookies.